The Korean, Chinese and Christian connection ! Qin, 秦朝 the first imperial dynasty of China, lasting from 221 to 207 BC. The Hata clan (秦氏) was an immigrant clan active in Japan since the Kofun period, according to the epic history Nihonshoki. Hata is the Japanese reading of the Chinese (state and dynasty) name 秦 given to the Qin Dynasty (the real family name was Ying), and given to their descendants established in Japan. 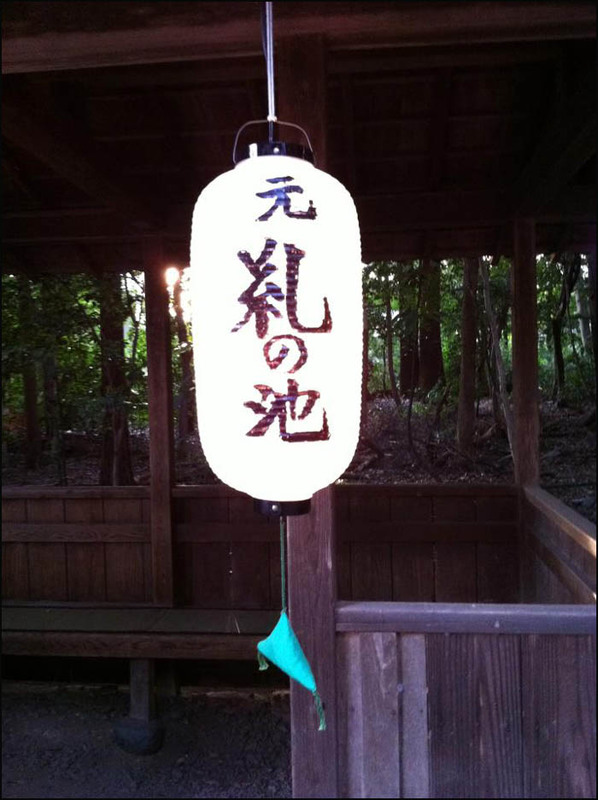 The Nihonshoki presents the Hata as a clan or house, and not as a tribe; also only the members of the head family had the right to use the name of Hata. The Hata can be compared to other families who came from the continent during the Kofun period: the descendants of the Chinese Han Dynasty, by Prince Achi no Omi, ancestor of the Yamato no Aya clan, the Sakanoue clan, the Tamura clan, the Harada and the Akizuki clan; also, the descendants of the Chinese Cao Wei Dynasty by the Takamuko clan. 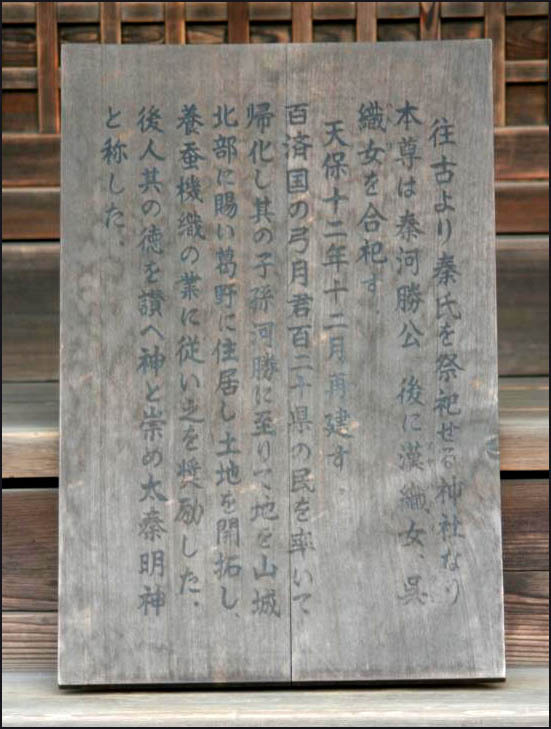 The descendants of Baekje Paekche (Kudara in Japanese) who sought refuge in Japan, for example the Yamato no Fubito (also called Yamato no Fubito- 和史 later given a new title, Takano no Asomi- 高野朝臣), Kudara no Konikishi clan, and the Sue clan. The Hata are mentioned by name more often than almost any other immigrant clan in the Nihonshoki, one of Heian-period Japan's epics, combining mythology and history. The first leader of the Hata to arrive in Japan, Uzumasa-no-Kimi-Sukune, arrived during the reign of Emperor Chūai, in the 2nd century CE. According to the epic, he and his followers were greeted warmly, and Uzumasa was granted a high government position. Roughly one hundred years later, during the reign of Emperor Ōjin, a Hata prince called Yuzuki no Kimi visited Japan from the Kingdom of Baekje in Korea. He said he had come from Baekje, and he wanted to emigrate to Japan, but that Silla would not permit him to do so. Fushimi Inari Taisha, Matsunoo Taisha, and Kōryū-ji. ... In addition, many towns in Japan are named after the clan, such as Ohata, Yahata, and Hatano. The population of Neyagawa in Osaka Prefecture includes a number of people who claim descent from the Hata.
. Bull Festival of Uzumasa, 太秦の牛祭 . Kyoto, temple Kooryuji 広隆寺 Koryu-Ji. Hata-no-Kawakatsu (秦河勝), the leader of Hata-uji in 603 in the Asuka period. which enshrines Hata no Kawakatsu. Shinra, the Japanese version of Silla, the Korean Kingdom. is believed to enshrine the tutelary deity of immigrants from ancient Korean Shinra (or Shiragi, 新羅) around the 4-7 century. Immigrants from ancient Korean were employed as technical specialists of sericulture, fabric, papermaking, ironmaking and blacksmith, which are traditional handicrafts descended from generation to generation in the Hokuriku district.
. Kara no kami 韓神 / 漢神 Deity from Korea . This kind of torii has three top lintels. The three pillars symbolise heavens, earth and mankind　天地人. Some sources state that this was a secret symbol of the underground Christians for the Holy Trinity.
. Uzumasa no Konoshima Jinja 太秦の木嶋神社 . and the Korean connection to the Hata clan (秦氏). Toyotamahiko-no-mikoto (豊玉彦尊, = Wadatsumi-no-kami (綿津見神 or 海神)). It seems only male deities who have Wadatsumi's blood in their veins are enshrined in this style to be immersed into water. 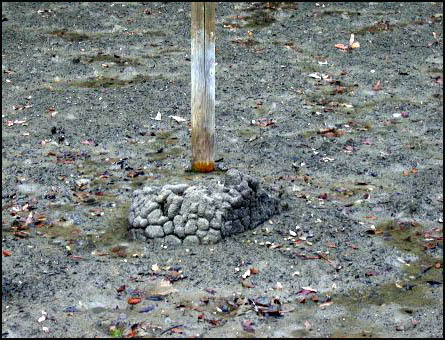 According to this rule, the stone piles under the three-pillar Torii at Konoshima Jinjya must be the grave of deity who is the offspring of Wadatsumi. Among the enshrined deities at Konoshima Jinjya, there is only one deity who is the offspring of Wadatsumi. His name is Ugayafukiaezu-no-mikoto, who is the grandson of Wadatsumi and the father of Emperor Jinmu (神武天皇).
. Jinmu Tenno 神武天皇 and the Wakasa connection .
. Azumi no Isora Maru 阿曇磯良丸 Isoramaru . "Moto" means "original" and "tadasu" means "repent one's sin". It is said that this pond is considered as the original place of River Mitarashi (御手洗川) in Tadasu-no-mori forest (糺の森) at Shimogamo Jinja and the name was transferred to the forest at Shimogamo, suggesting a special relation between Hata-uji and Kamo-uji. Consistently, the crests of Kamo Jinja, Konoshima Jinja and Matsuo Taisha are all Futaba Aoi. On the midsummer day (doyoo no ushi no hi 土用の丑の日), a baptism-like ritual is held at River Mitarashi (御手洗川) in the forest Tadasu-no-mori (糺の森) at Shimogamo Jinjaa.
. kinu 絹　Sericulture, silk and the Hata clan . Kokai Jinja 蚕養神社 "silkworm shrine"
one of the most famous festivals in Japan. It spans the entire month of July and is crowned by a parade, the Yamaboko Junkō (山鉾巡行) on July 17. "Prince Troy and his wife and children"
made in Belgium and was imported to Japan in the 16 century. Kyoto Gion Festival (祇園祭) is coming this July 17th. 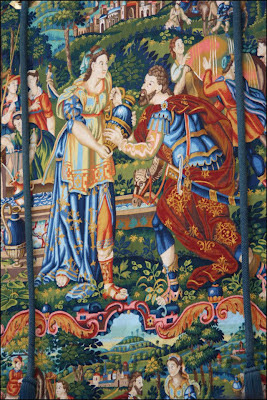 Yamahoko (山鉾, floats) will be decorated by gorgeous tapestries. 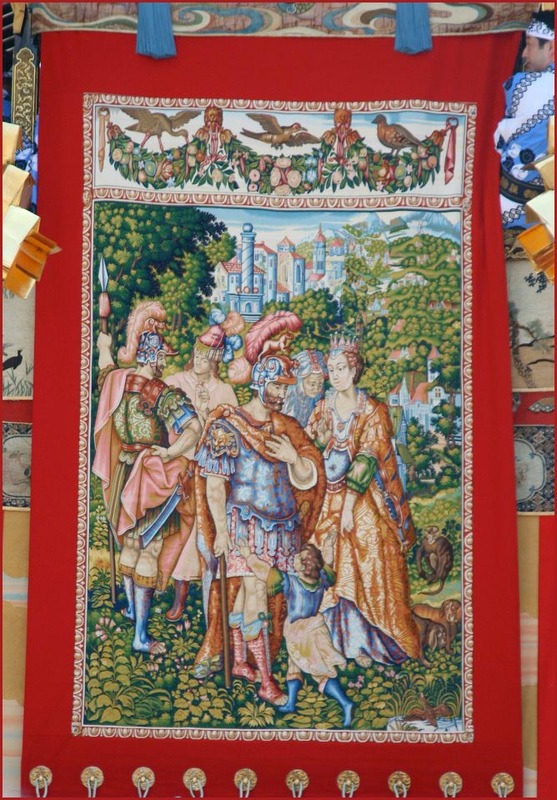 If you are there, you will be surprised to see most tapestries are not traditional Japanese ones and some are European, Islamic and even Judaism arts. 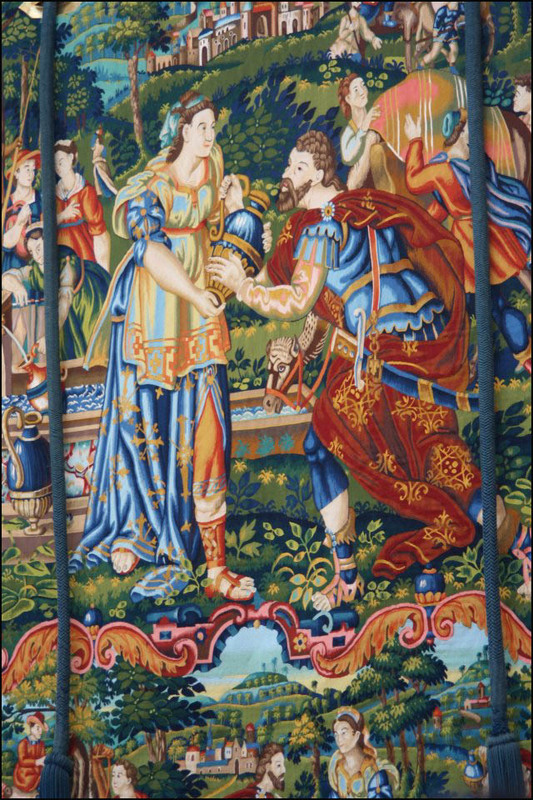 Here is the example, Kankoboko (函谷鉾)'s tapestry made in Belgium in the 16 century - "Rebecca giving water to Isaac", a famous scene from Hebrew Bible. is the day that Noah's ark drifted to Ararat!
. War of Troy tapestry .
. WKD : yababoko 山鉾（やまぼこ）Gion Festival floats .
. Fushimi Inari Taisha 伏見稲荷大社 Kyoto . In 711, Hata-no-Irogu (秦伊呂具), who is considered as the brother of Hata-no-imikitori (秦忌寸都理), established this shrine by enshrining the Inari deities at Mt. Inari (稲荷山) in Kyoto.
. Hakusan shrines 白山神社 "White Mountain shrines" .
. Matsunoo Taisha 松尾大社 Matsu no O Taisha . Founded in 701 by Hata no Tori 秦都理(はたのとり). Kamo shrine coplex, the location was once Tadasu no Mori (糺の森), the wild forest home of the exclusive caretakers of the shrine from prehistoric times.
. Aoi festival (Aoi matsuri 葵祭) . Kamo no aoi 賀茂葵（かものあおい）"hollyhock from Kamo"
. hollyhock, mallow 葵 (あおい) aoi . Hata Kawakatsu　秦河勝　founded Kouryuji Temple at Uzumasa, Kyoto in 603 and became the most influential brain of Crown Prince Shoutoku, the regent of Emperess Suiko. also known as Prince Umayado (厩戸皇子, Umayado no ōji) or Prince Kamitsumiya (上宮皇子, Kamitsumiya no ōji), was a semi-legendary regent and a politician of the Asuka period in Japan who served under Empress Suiko. "a prince born in a stable". The situation of the birth of Shoutoku remind us of the one of Jesus Christ. 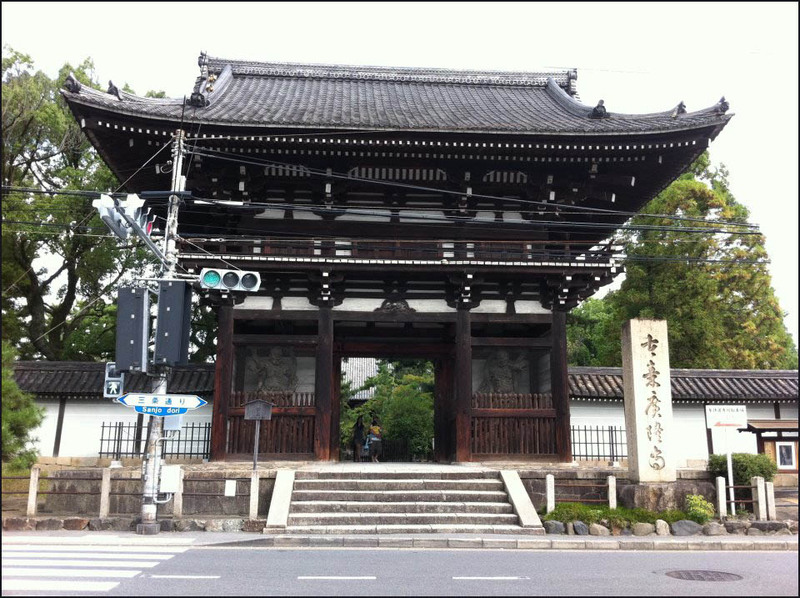 Hata Kawakatsu founded Kooryuji Temple at Uzumasa, Kyoto in 603 and became the most influential brain of Crown Prince Shoutoku. the regent of Emperess Suiko.
. Shotoku Taishi 聖徳太子 . 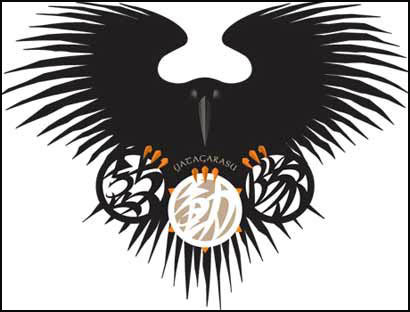 The three-legged crow (raven) was the guide of emperor Jimmu (Jinmu Tenno 神武天皇) when he visited the Kumano region.
. Kumano Gongen 熊野権現 . There is a torii gate with three pillars. The stone lantern at this shrine also does have three openings. 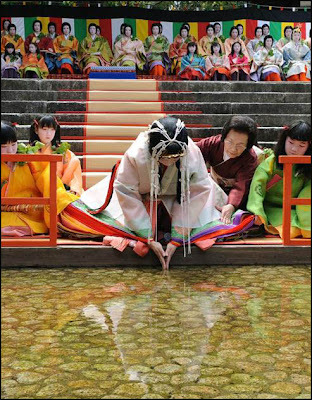 Many of the traditional ceremonies in Japan seem to be the traces that the Jews and the Ten Lost Tribes of Israel came to ancient Japan. Japanese Religious Priests "Yamabushi" Put A Black Box on their Foreheads Just As Jews Put A Phylactery on their Foreheads. Japanese "Omikoshi" Resembles the Ark of the Covenant. The Robe of Japanese Priests Resembles the Robe of Israeli Priests. 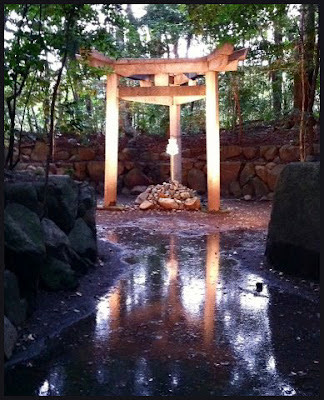 The Structure of the Japanese Shinto Shrine is the Same As God's Tabernacle of Ancient Israel. Festivals of Japan Resemble the Festivals of Ancient Israel. Old Japanese Words Have Hebrew Origin. Lost Tribes of Israel Came to Ancient Japan. We can trace the ancestry of Japanese (or at least the Royal Family which have continued for 2672 years) into people from the ancient Israel, 10 Lost Tribes. Hata-uji-rerated and Matsuo Taisha's outer precincts shrine Tsukiyomi Jinjya (月読神社) in Kyoto. This shrine received the deity from Tsukiyomi Jinjya in Island Iki (壱岐島), who is believed as the tutelary deity of Ama-zoku (海人族, Ama tribe) in Island Iki, suggesting a special relation of Hata-uji and Ama-zoku as well as the Hata-uji's immigration route. Shotoku Taishi (聖徳太子) is also enshrined at Tsukiyomi Jinja in Kyoto.